Gorgeous BNIB Clarks black slip on shoe sandals with a velcro strap size 8 eu 42. Clarks Women Sandals Slip On Leather New Size UK 6. Dispatched with Royal Mail 2nd Class. Dclarks 5 slip on sandals black leather cushioned inner..buckle to sid.adjust. Dclarks 5 slip on sandals black leather cushioned inner..buckle to sid.adjust.. Condition is Used. Dispatched with Royal Mail 2nd Class. CLARKS WHITE LEATHER MULES SIZE 7D. Size 7D Clarks White Leather mules. Good used condition. 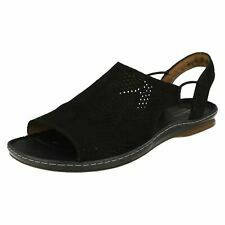 Ladies Clarks Black Leather Toe Post Sandals. UK Size 5 1/2. UK Size 5 1/2. Condition is Used. Heel type.Wedge. As I Have Said They Are A Pre Owned Pair Of Shoes, But Not A Lot Of Wear On Them.Good Used Condition. Size 5 1/2 UK. CLARKS Artisan Flower Design Black Leather Toe Post Sandals Size 7D. Have been worn a few times but in excellent condition. UK postage only please. Clarks Sandals Size 5 Silver Metallic Slider Slip Summer Holiday Casual Buckle. Condition is Used. Dispatched with Royal Mail 2nd Class. Worn once. 100% genuine leather uppers and soft real suede padded footbed for comfort. Could be fixed with a little shoe polish or brown felt tip pen. Marks are very small. Otherwise sandals are in perfect new condition as never worn. CLARKS Active Air White REAL LEATHER Ladies Sandals/mules size UK 7 had minimal wear and in excellent condition. Clarks Brown Leather Sandles with cushioned inner sole area. Condition is Used. Dispatched with Royal Mail 1st Class. Comfortable pair of sandals from Clarks. Uk size 4. Leather upper with rubber soles. Adjustable strap. Lightly cushioned leather footbed. Look great with skinny jeans! Worn but in decent condition. Woman's cerise pink Clarks plus wedge sandals size 5 D vgc. Condition is Used. Dispatched with Royal Mail 2nd Class. Clarks 'Umbrage Uma' Taupe Leather Slip-OnSandals. A foldover riptape strap adjusts for optimum fit and comfort, while the moulded sole and footbed give support and enhance the active feel. Lining Material: Textile. Lovely Black Leather CLARKS Cushion Soft Slip on Mules Sandals. Photos lightened for the purpose of showing detail only. Ladies lovely pretty peg toe sandals. Approx 1/2 heel. 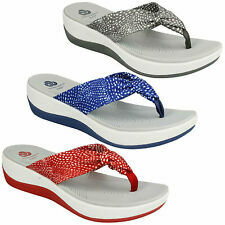 Ladies Lovely Clarks Springers Sandals. These sandals are cream and grey in colour. 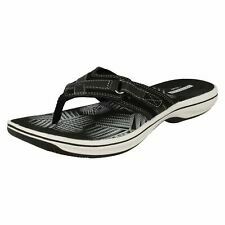 These sandals are slip on in style with a toe post. These sandals are a size 5. 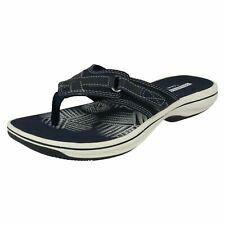 I have marked these sandals as used but they have only been worn a couple of times so there is minimum wear to the inner and outer soles. They are in a clean condition. Really nice pair of sandals in a neutral colour. Clarks ~ Tan Brown Leather Slingback Sandals Wooden Heels ~ Size 7. Condition is Used. Dispatched with Royal Mail 2nd Class. Clarks women shoes red wedges size 4. Condition is Used. Dispatched with Royal Mail 2nd Class. These ladies medium brown slip on sandals are a size 6 and have a 2ins wedge heel, an adjustable side buckle and soft comfy insoles. They are used but still in good condition with plenty of wear left in them. Please see all photos as they are part of the description. Clark Clog Slip On Size 4 In Verygood Condition. Condition is Used. Dispatched with Royal Mail Signed For® 2nd Class. Clarks Silvi Shade Gold Leather Toe-Post Mule Sandals. Size 7. Worn a couple of times so in great condition. Just a bit flat from being stored in a drawer. Dispatched with Royal Mail 2nd Class. Lovely slip ons. brown leather. in good overall condition. Ladies Clarks Pink Leather toe-post Sandals Size 6.5D. Condition is Used. Dispatched with Royal Mail 2nd Class. WOMENS CLARKS ARTISAN METALLIC BROWN LEATHER SLIP ON TOE POST SANDALS UK 5.5 D. Condition is Used. Dispatched with Royal Mail 2nd Class. S of t in ne r fo ot be d fo r co mf or t fi t.
Clarks Size 6 Leather Slip On sandals in a great used condition. Condition is Used. lo ad s of l if e le ft.